Global Steel Rebar Market size was worth over USD 120 Billion in 2016 and will surpass 410 million tons by 2024. 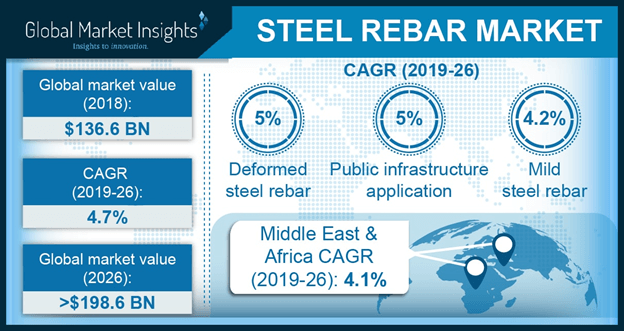 Increase in infrastructure spending on highways, bridges, buildings and public utilities are expected to propel global steel rebar market growth. Upsurge in smart city projects supported by government and private financing will support product penetration. As per industry estimates, global smart city projects valued over USD 14 billion in 2015, observing over 18% CAGR. Rapid business expansion globally will be key factor driving growth. Healthcare facilities expansion across Europe and Japan owing to increase in geriatric population will augment product demand in institutional sector. European health sector accounted for 10% of GDP and 15% of public expenditure in 2016. Increasing necessity for more educational infrastructure in MEA will boost steel rebar market growth. Additionally, ongoing technology services sector expansion globally will propel spending on telecommunications infrastructure. Steel manufacturers are expected to adopt vertical integration strategy to avoid additional expenses and gain competitive advantage. For instance, US Steel holds an iron ore mine and hold a share in two joint ventures with Tilden Mining Company and Hibbing Taconite Company. Thus, allowing access to around 900 million tons of iron ore reserves. In addition, the company has a production capacity of 25 million tons of iron ore pellets annually which it expects to expand by over 10%. Depleting iron ore reserves is one of the biggest challenges the industry is anticipated to face over the forecast period. Fluctuation in raw material price index and cyclic product demand likely to influence industry growth. Other factors affecting steel rebar market price trend include production losses, tightened money supply, slowdown in investments, fuel prices and government regulations. Deformed steel rebar market accounted for over 70% share in 2016. Increasing necessity to build and upgrade existing transport facilities to improve productivity will boost product demand. Key properties such as better mechanical anchoring and minimum slippage fueling deformed bar segment growth. Rising product demand for reinforced concrete cages, slabs, columns, prefabricated beams, and precast applications will drive industry growth. Mild steel rebar demand is estimated to surpass 100 million tons by 2024. Factors such as cost and ease of recycling driving product demand for construction purposes including bridges and buildings. It is generally used for heavy engineering projects which require substantial amounts of steel. Rising demand for consumer oriented construction will further propel the market size. 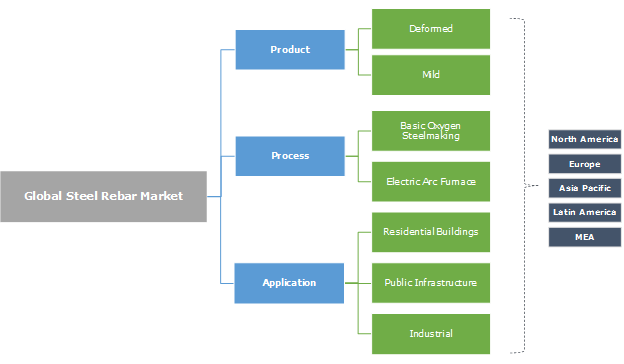 Basic oxygen process market was valued over USD 70 billion in 2016. It is an autogenous process or self-sufficient in energy. Factors such as technological advancement, improved turn-down control and availability of liquid hot metal driving steel rebar market growth. Manufacturers are expected to invest in modern technologies to reduced capital cost, smelting time, and increase overall productivity. Electric arc process will witness growth over 4.5% up to 2024. Increasing demand for high quality building materials, availability of domestic scrap, low operational costs owing to different charge material and improvements in processing are driving high application of electric arc furnaces. Worldwide stringent government regulations on oxygen converter process likely to favour this segment growth over the projected timeframe. Demand from residential was estimated over 95 million tons in 2016. Growing vertical model of development to rebuild old residential apartments lying in decrepit condition will drive product demand. Governments are likely to demolish old apartments to avoid accidents during natural calamities. Rising construction of civic amenities and new houses under urban development programmes will fuel the product demand. Industrial application will witness growth over 3.5% up to 2024. Increasing government focus on the reinforcement of existing industries infrastructure will support segment growth. Manufacturers are likely to upgrade their annual production output to gain competitive advantage. Expansion of current manufacturing and business houses will drive the steel rebar market growth over the forecast period. North America market was valued over USD 10 billion in 2016. Improved economic conditions owing to rising income level are expected to drive regional demand. Rapid infrastructural development in industrial and service sectors likely to enhance product penetration over the projected timeframe. Several government programs, including, New Building Canada Plan (NBCP), Made in Canada and Affordable Housing Initiative (AHI), will support the industry’s growth. The Canadian construction industry was valued at over USD 289 billion in 2015 and expected to significant growth over the projected timeframe. Europe steel rebar market will witness CAGR over 4% up to 2024. Prevailing low fare prices driving arrival of more foreign tourists in the region. Several hotel chains are expected to renovate their existing infrastructures to improve occupancy ratios and average room rates. This will propel regional product demand. Asia Pacific accounted for more than 65% industry share in 2016. Rising population particularly in China and India led to a surge in urban development projects. As per China’s National Urbanization Plan, the government aim to turn migrants in to the urban citizens which will raise urbanization rate to 60% by 2020. This will drive regional industry growth over the forecast period. Global industry share includes ArcelorMittal, Gerdau, Nippon & Sumitomo Metal Corporation, SAIL, Tata, Essar, Jindal, Steelasia Manufacturing Corporation and Acerinox. Other prominent industry players are Hyundai, Daido, Kobe, NJR and Byer. Manufacturers are expected to invest in capacity upgradation and adopt innovative solution through extensive R&D for attaining competitive advantage. Companies are employing merger and acquisition strategy to enhance their market share. For instance, Tata announced its expansion plan in India by upgrading Jamshedpur facility to 11 million tons in 2017. The company also announced merger with ThyssenKrupp in Europe, to improve capacity utilisation and their related downstream facilities across Germany, Netherlands and UK. Steel rebar are used to help concrete withstand tension forces. They are also used to hold other bars in the correct position to accommodate their loads. Global industry has witnessed significant price fluctuations in recent years owing to expensive environmental policies and international competition. China plan to cut down steel capacity by 100 million to 150 million tonnes to push supply-side reform and reduce overcapacity in the sector over the forecast period. Key industry participants are anticipated to integrate business operation including extraction, processing, and distribution. The entire process of extraction from mines to producing finished material will save a lot of time and cost for industry players. Increasing adoption of newer technologies such as the Cortex process and Hismelt process will further support industry growth.